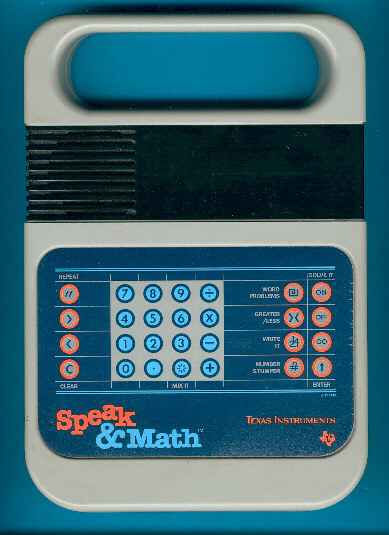 Size: 10" x 7" x 1.3"
This Speak & Math model from the year 1986 got a slightly changed keyboard design. View the original Speak & Math here. Other products in the Speak & line cover spelling and reading words. Compare this Speak & Math with both Speak & Spell and Speak & Read. A compact version without display was sold in France (le Calcul magique) and Germany (Mathe-Fix). The Speak & Math is featured in the Texas Instruments Incorporated leaflet Follow the Learning Path™ dated 1991.